Brooks’s marketing pitch: The perfect balance of soft cushion and support. Midsole: Tri-density midsole with a firm medial post. 12 mm heel offset. 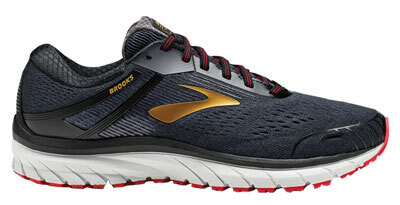 Brooks’s popular support shoe gets a new and spacious upper along with a slightly softer ride. Runners seeking mild-support or stability shoes never had it so good. There’s no dearth of models to choose from. Do you want a full-blown stability shoe with all the bells and whistles? There’s the Brooks Beast and the New Balance 1340V2. How about some lightweight support? The New Balance 1500 V3. Want the cushioning of a plush neutral trainer with a hint of a medial post? It’s the Saucony Hurricane or the adidas Supernova ST in that case. And then there are mid-range support shoes. These shoes sit right between the cushioned and the lightweight support models. They are known by many names – the Asics GT-2000, Nike Structure, New Balance 860 and so on. 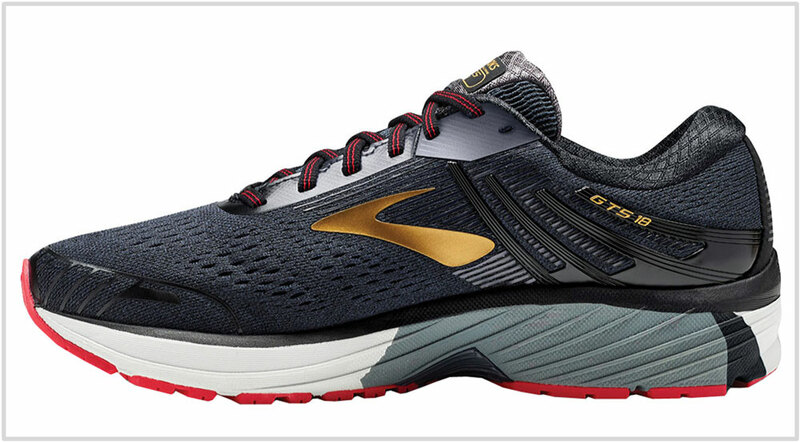 The Brooks Adrenaline GTS 18 (Go To Shoe) has long been one of the most popular support shoes in this class. The number ’18’ denotes the number of years of the shoe has been around. Like most successful franchises, the key to the Adrenaline’s longevity has been its consistency. Unlike many other shoes which go through radical re-positioning, the Adrenaline has stayed true to its mission. Which is being a support shoe with a balanced and yet padded ride quality. The midsole is made of an EVA foam variant with the assuring presence of a medial post. 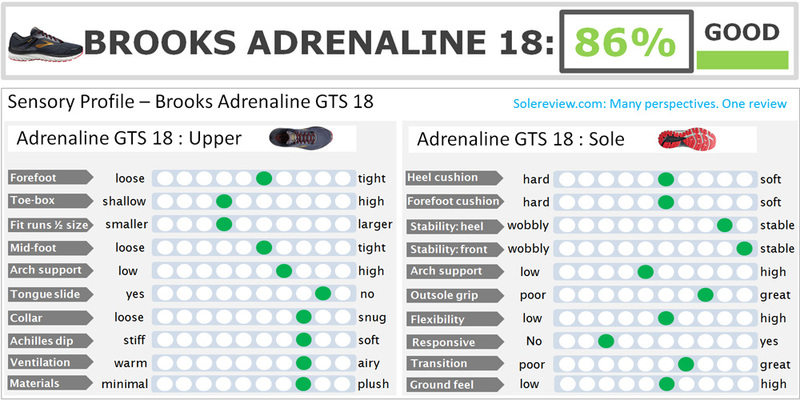 And while the GTS 18 happens to be a major update, none of the changes mess with the Adrenaline’s core character. The ride, albeit softer, is still balanced. The medial post continues to be an important component of the midsole. The upper is completely redesigned. This results in fit and feel changes which we’ll sum up during our fit break-out in this review. By most standards, the GTS 18 is an improvement over the last one. One of the first things you’ll notice different about the 18 is that it’s a bit softer than the 17. While the entire midsole is softer, the change is more pronounced under the forefoot. This is because the 18’s midsole simplifies its construction by reducing the number of foam densities. The GTS 17’s main midsole on the outer/lateral side had two stacks of foam. 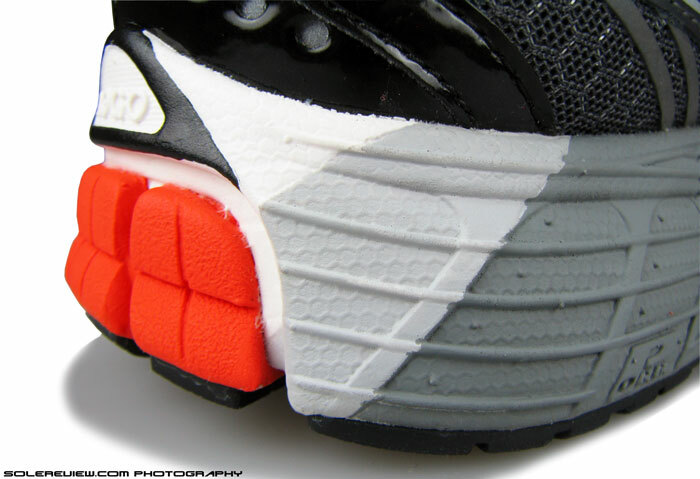 This upper layer also formed the inner midsole under the forefoot area. Not this time; Brooks sneakily replaces the upper foam layer with a paint job. So the GTS 18’s lateral midsole appears as if it’s got layers of foam, but actually happens to be a single density foam which is slightly softer. This update makes the forefoot softer and smoother. The forefoot also has a soft and grippy rubber outsole, so the overall forefoot strike experience is padded. Also affecting the ride quality is a thick compression molded insole over the midsole which adds top-layer cushioning. We must make it clear that while the GTS 18 is softer than the 17, it is still a firm shoe when compared to neutrals like the Ghost or Glycerin. After all, the Adrenaline is a stability shoe with a dual-density medial post. Speaking of which, the medial-post uses the now-familiar design with two different kinds of foam. There’s the large foam block under the arch, and another thin layer separates it from the main midsole. This thin strip is softer than the medial-post but firmer than the rest of the midsole. It creates a nice transition zone when the foot is rolling in and prevents the abruptness which can sometimes be experienced in a stability shoe. This isn’t a new feature, and the Adrenaline has used it for many years now – even the DNA Gel based model had it. 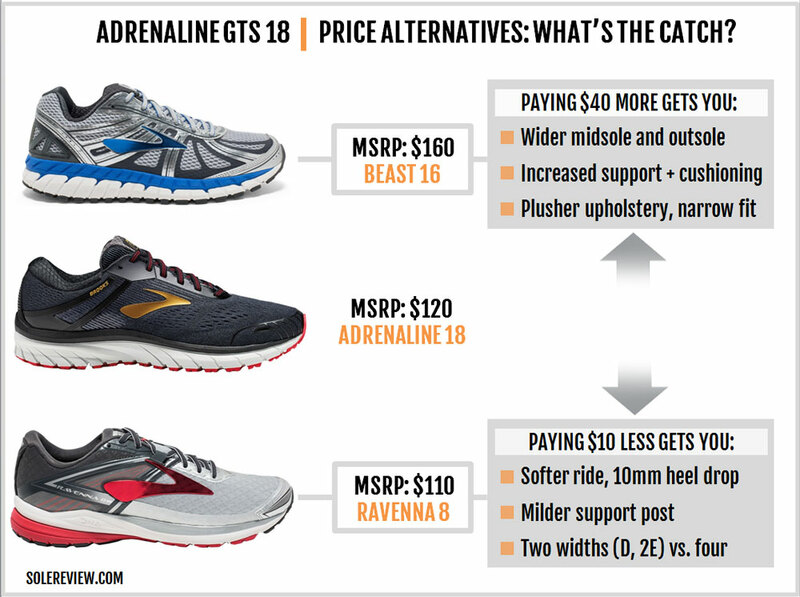 Regardless of the medial post, the GTS 18 has a balanced ride, and more so than the 17. This again, has to do with the density. The thin strip separating the medial post and the midsole spreads wider under the heel than the 17. This helps make the ride more balanced and supportive with none of the cushioning bias or skew. The ride is smoother and consistent due to the new midsole and the full contact outsole. The soft rubber provides coverage along the length of the midsole, a design which helps transitions. The forefoot is flexible but does not overdo it. The transitions, though not fast, aren’t sluggish either. You won’t find any responsive feedback from the GTS 18. The DNA foam isn’t springy or such. The removable insole has a hint of responsiveness but the sensation dissipates over time. The GTS 18 is significantly lighter (nearly an ounce) than the 17 due to the midsole and upper updates. That said, the GTS feels more bottom-heavy than the 17 due to the minimal upper. The Adrenaline is best used as a daily cushioned trainer for varying mileages. Though the ride quality is firm, there’s no dearth of cushioning during longer runs. If you need something softer and/or lighter, then we’ve listed a few options further down this review. 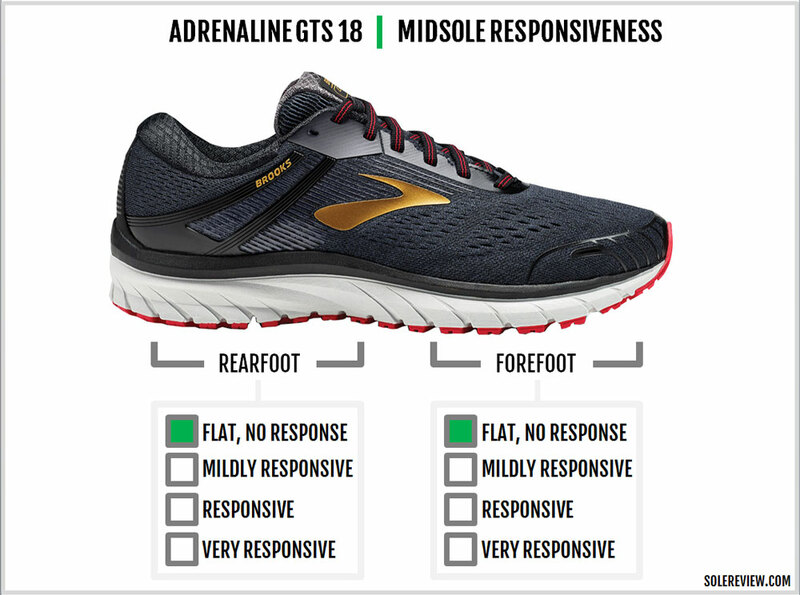 The GTS 18’s upper is where all the major changes to the fit and feel take place. If the GTS 17 was an example of an overly structured upper, the GTS 18 is its polar opposite. The new Adrenaline gets rid of the most of the overlays and substitutes that with engineered mesh and fused urethane layers. 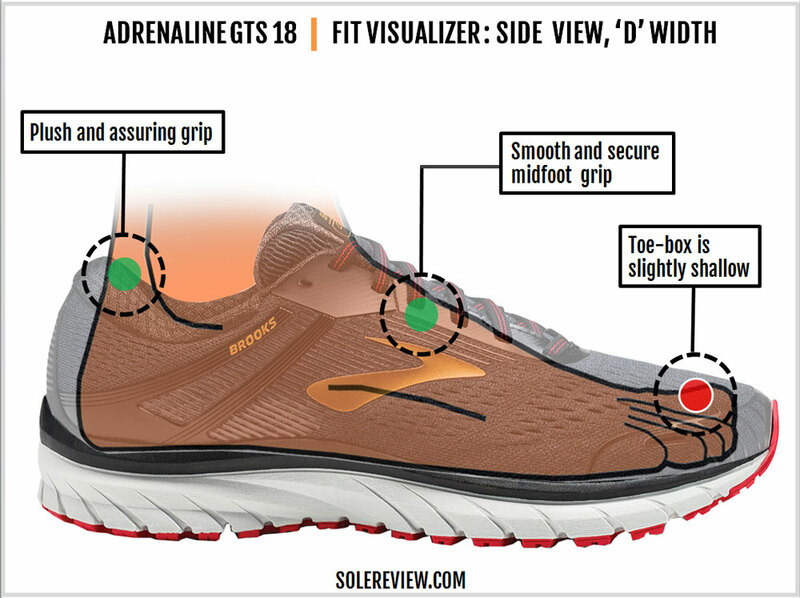 The updates are functional in nature and have an noticeable affect on the GTS’s upper fit. A drastic reduction of the external forefoot and midfoot overlays frees up room inside. Also, the lacing starts further away from the toe-tip as compared to the 17. 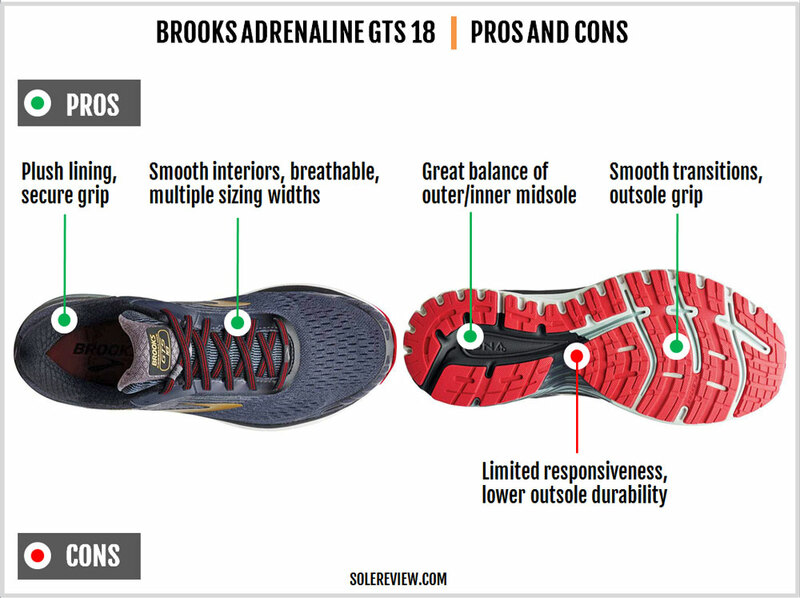 As a result, the GTS 18 has a roomier and ventilated forefoot fit on the sides. The feel is also smoother as there’re no synthetic layers pressing over the foot. The mesh used is softer and this creates a pleasant interior environment with no hot spots. Changing the toe-bumper from a stitched to a fused type makes the toe-box shallower than the 17. The fused bumper isn’t the only reason for the shallowness, though. 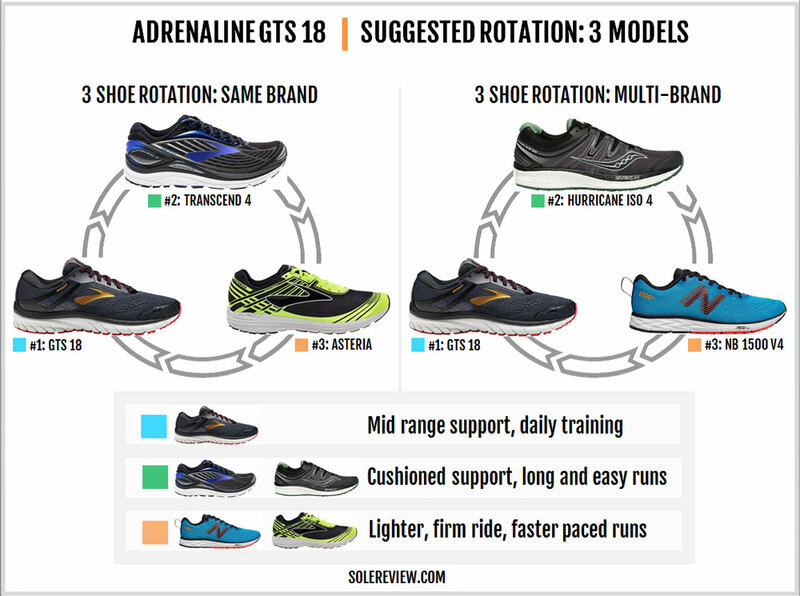 The GTS 18’s heel counter has an increased inwards curve than the 17. The plush heel is an improvement on the sub-par heel of the GTS 17, but in the process pushes the foot slightly forward into the toe area. The extent of size shortness is around 1/3rd of a size rather than a half size, so most runners will be on the fence between buying true-to-size or half-size up. Try before you buy. The GTS 18 lacks an inner sleeve so the tongue is on its own. However, Brooks’s unique ‘tongue-tied’ loop prevents any slide. The tongue is padded with a soft lining which feels comfortable over the foot. The laces are flat and semi-stretchy which is the same as the 17. 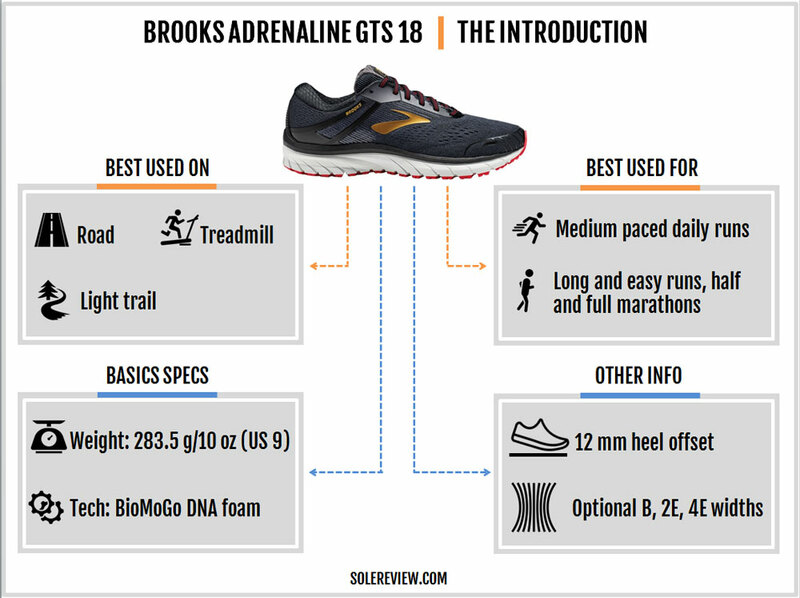 There’s no break-in period required for the GTS 18; the upper feels great right of the box. The GTS 17 had a lot going on over its forefoot and the materials had a tendency to bunch/gather during flexing. The GTS 18 has none of that, which is great. 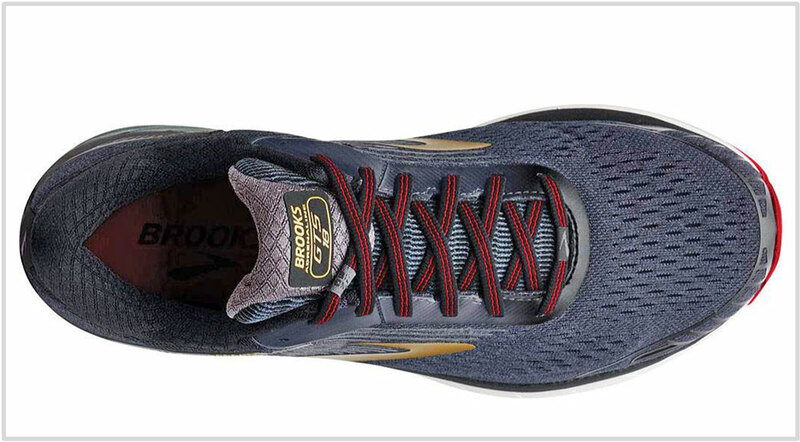 With Brooks’s outsole rubber, expect a slightly lower lifespan when compared to adidas or Nike outsoles. 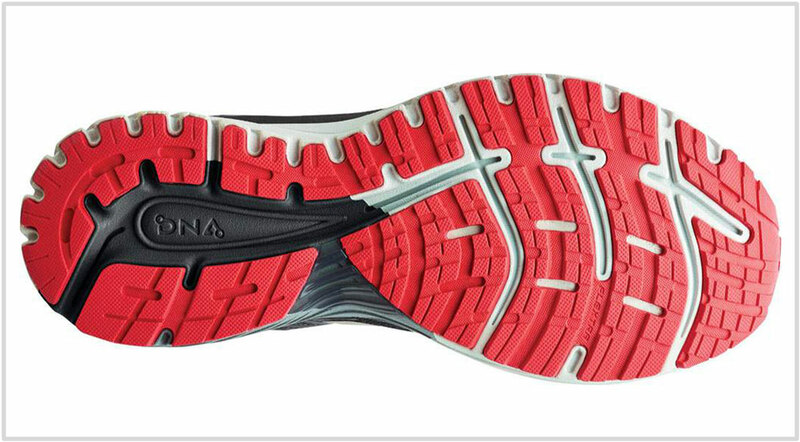 The Brooks outsole rubber grips great but the trade-off is durability. 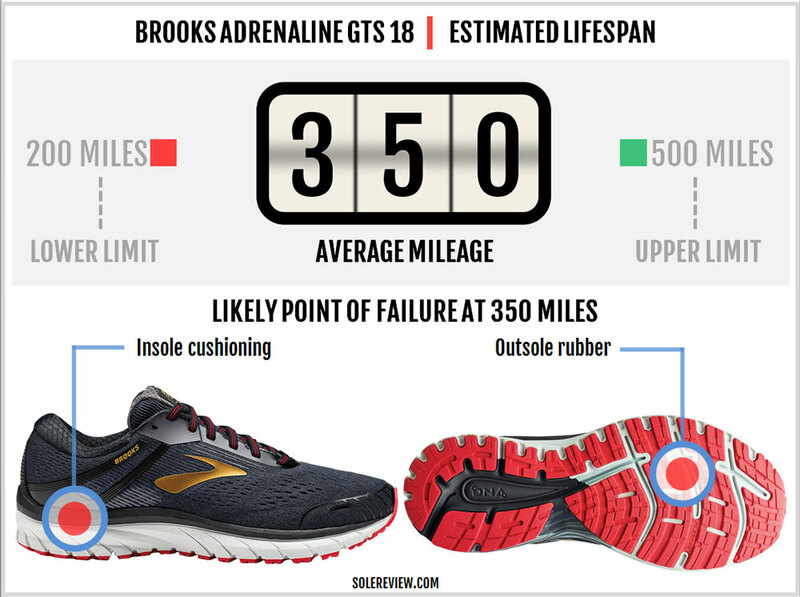 Nonetheless, the Adrenaline’s outsole life is no more or less than other Brooks shoes you’ve been used to. We’ll have to wait and see how the upper performs from a durability standpoint. Unlike the Levitate, the Adrenaline’s upper doesn’t have an internal sleeve as an reinforcement. So far, there seems to be no problem but we’ll update this section if we receive adverse feedback. 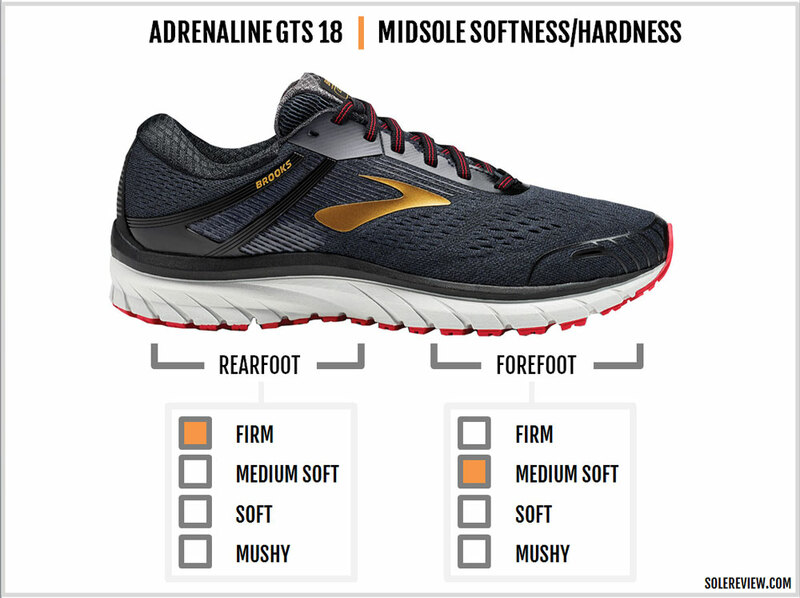 The GTS 18 has an improved upper fit. The minimal design creates a smoother, more relaxed fit experience. Breathability is better as well. And while New Balance may be the king of optional widths, Brooks comes a close second. The Adrenaline is available in four widths, ranging from a B (narrow) to a 4E (extra wide). Responsiveness isn’t the DNA foam midsole forte. Rather, delivering a supportive and consistent ride experience is. With Brooks, the math is pretty simple. You pay more money, you get more support. Pay less, and there’s a corresponding decrease in the support level. Case in point is the Brooks Beast 16. With exceptional levels of support, this is the grand daddy of stability shoes It is very cushioned too. You need to watch out for the tight upper fit – a width 2E needs to be treated as a D.
The Ravenna 8 is a mild-support alternative if you don’t require Adrenaline levels of stability. It has a softer ride with a smaller medial post. There are a couple of ways you could approach the Brooks rotation. 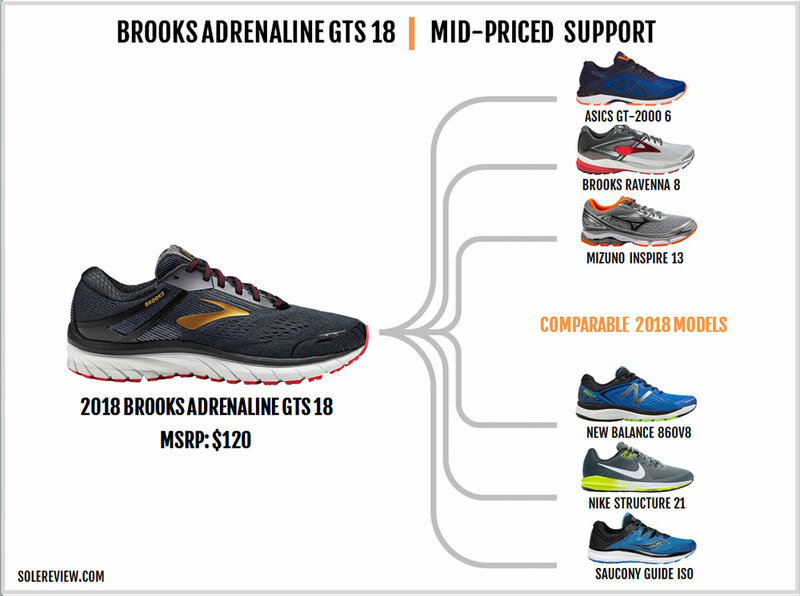 You could either use the Brooks Transcend 4 as a more cushioned and supportive companion to the GTS and then get the Asteria for your quick 5K and 10K’s. On the other hand, if the Adrenaline is cushioned and supportive enough, then consider the Ravenna 8 instead of the Transcend. The Ravenna will be somewhere between the Adrenaline and Asteria. The Saucony Hurricane ISO 4 is a support shoe which has plenty of deep cushioning. Pair that with the New Balance 1500V4 for fast training and you’re all set. The 4th version of the 1500 carries over the V3’s sole unit so you get an identical ride experience. The Saucony Guide ISO and the New Balance 860V8 compare with the Adrenaline on the ride quality. 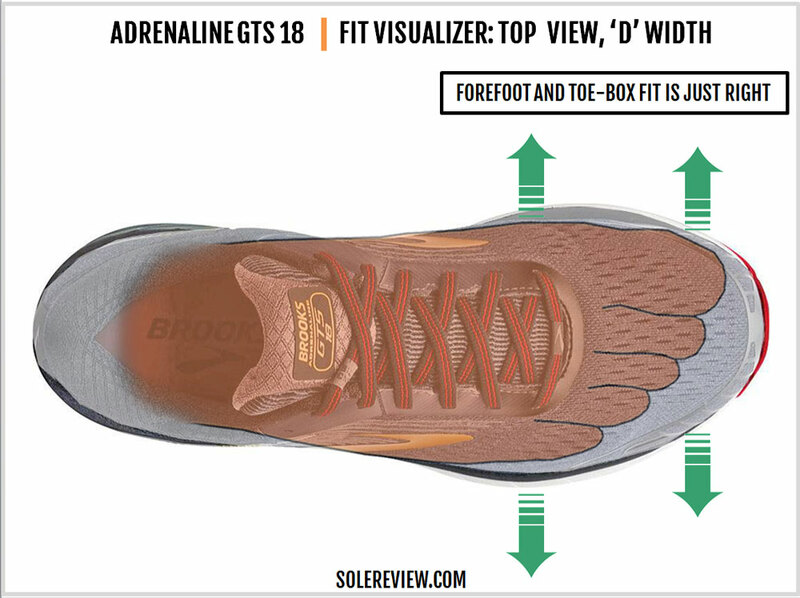 Though the Guide’s midsole is firmer, its Everun topsole produces some degree of responsiveness. The New Balance uses a foam stack similar to the GTS and the upper fit quality is close too. If you want an ultra-firm ride, the Nike Structure 21 gives you that. The forefoot is responsive thanks to the Zoom Air bag while the firm heel is very supportive. The Mizuno Inspire 13 (now going on 14) offers a cushioned and supportive ride with a spacious interior. Lastly, the Asics GT-2000 6 and the Brooks Ravenna 8 offer a marginally softer ride. Both are supportive, though they have a bit of a lateral bias when compared to the GTS.